What a wonderful day - the sun is shining here in West Sussex, there is just ONE more sleep until we get our puppy and I have something to share with FO Friday! I absolutely LOVE these socks although they are, as the title suggests, completely impossible to photograph. The camera can not correctly capture the orange, red, pink and brown - so you have to take my word that they are gorgeous! This is my usual 'vanilla' sock - a personalised pattern based on Wendy B Johnson's Gusset Heel Basic Socks, with additional shaping over the widest part of my foot, a longer ribbed section for the leg and knit two-at-a-time on a single circular needle (find my tutorial here). I particularly like this heel as I tend to wear a lot of clogs with my handknit socks and this is very neat. The self-patterning yarn is Regia Snowflake Color (shade 7712). 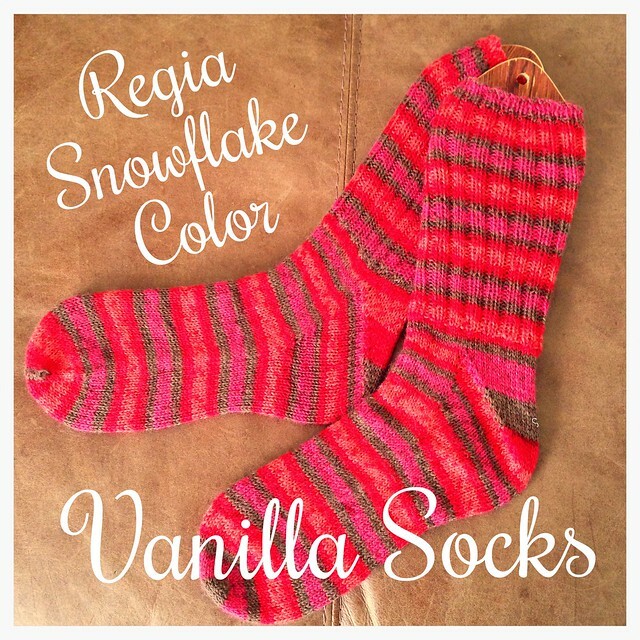 I have made several pairs of socks with Regia and am never disappointed. It knits up really nicely and wears and washes well, plus there are some beautiful colours to choose from. Black Sheep Wools have kindly offered another ball of the same colourway I used here for a lucky reader. To enter, simply leave a comment on this post telling me which is your favourite way to knit a sock - toe-up/cuff-down, and type of heel (or which you plan to start with, if you haven't tried socks yet). I'll randomly select a winner next Friday (27th Sept) - please remember to leave your Ravelry name or email address so I can contact you if you win. Good luck! Congratulations to Ruth who is the lucky winner!!! Those are SO gorgeous. I absolutely love them. And isn't Regia amazing?? I made a hat out of it this week, so lovely. Can't wait to see your puppy, so jealous! Can you persuade my OH to get me one?! Pleeeeease.....OK no I will live vicariously through you, there'd better be lots of photos! As you know I am a 2 at a time toe up on one circular girl! I do Judy's cast on, bog standard toe increses, fleegle heel then head for home! Love my socks and never really wear anything other than hand knit. Have you seen the new spiral type pattern on Rav? http://www.ravelry.com/patterns/library/exotic-whirlpool think I could be tempted to go cuff down for these bad boys. I'm not able to knit 2 socks on the same circular so I need to watch your tutorial soon. I like to knit from the toe up. Heel? I want to try japanese short rows next time. These are great socks. How do you like that type of heel! Is it roomy or snug? I tend to knit toe up, two at a time the most, but I think I prefer cuff down! But it just seems to make more sense to knit toe up to use the most yarn. They are gorgeous socks, I love the idea of wearing hand knit socks with clogs. I shall have to go googling. I knit toe up with a forethought heel, using a variation on Cat Bordhi's Sweet Tomato Heel. I am currently making my first pair of socks, top down on DPNs using a free tutorial from Bernat. I don't have a favorite method of doing anything as yet but I hope to try some other methods, toe up, short-row heel, sweet tomato heel, etc. Okay, first I have to admit that as a beginning knitter, I am afraid of socks!!! I haven't even completed my Cozy Boot Cuffs that I started last winter at the Churchmouse Yarns & Teas workshop! I have noticed that the heels I like the best are those with very few Kitchener stitches (I also tend to like wearing clogs). I usually use two circular needles, always cuff down and either a gusset or slip stitch heel. These fit me just fine! Love a top down sock with a gusset heel. Always feel very smug at my own cleverness after knitting a sock!! I prefer to knit cuff-down. I love the color of your socks. Wow, those are great socks! I love to knit toe down, with a heel flap, preferably eye of partridge! Awesome socks! I knit cuff down, but love the way of trying on a toe up, I enjoy knitting a short row heel more but wearing a gusset.....so a little complicated. Regia is probably my go-to sock yarn. These are absolutely gorgeous. I Thought I had tried all of Wendy Johnson's heels, but I guess I haven't - I'll have to try a pair of these ones, it looks very effective. Toe-up 2 at a time on Magic loop, whatever heel is included on the pattern, since this is my first! When I first made socks, it was top down. Then tried toe up and loved it! it seemed so sensible. Since you have such a nice tute with great pictures for two-at-a-time, I'm going to try that real soon. I have heard so much good stuff about Regia, and this colorway is my favorite, so maybe I'll be able to try it if I win the yarn! I prefer top down and slip stitch heel. Ann Budd's socks are my favorite to knit and always on dpns. I have tried the two-at-a-time but it just got me too confused. Haven't tried a self-striping yarn yet but will do when I finish all the other wip projects am sitting on:-) I prefer the cuff-down method of sock-making although haven't tried to knit socks any other way. I self-thought myself how to make heels and to knit in the round, from youtube. Glad people share their knowledge! Good luck everyone. I could easily act like I know ANYTHING about knitting... but I'm a crocheter! Well - I'm a cuff down, old-fashioned heel sort of gal. Have just purchased a Craftsy class to learn how to knit cuff down socks. Can't wait to start and would love some yarn to go with it! I've not learned to knit socks yet, but I plan to learn soon. Planning to start toe up, 2 at a time on one circular needle. Is that a sensible idea for a first-timer, or slightly mad? Very tempted by the two-at-a-time tutorial! !